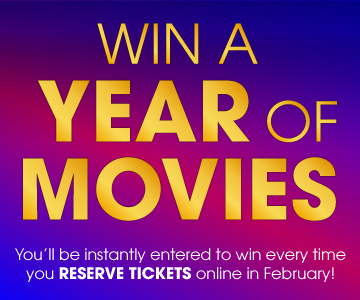 Instantly entered to win every time you reserve tickets in February! Reserve tickets on our website all month for your chance to win! 1. General Information: The ShowcaseCinemas.com Sweepstakes (the “Sweepstakes”), sponsored by National Amusements, Inc. (“Sponsor”), begins at 12:01 a.m. Eastern Standard Time on February 1, 2019 and ends at 11:59 p.m. Eastern Standard Time on February 28, 2019 (the “Promotion Period”). No purchase is necessary to enter or win, and purchase does not improve odds of winning. The Sweepstakes is void wherever prohibited by law, or where the Sweepstakes does not comply with applicable registration or filing requirements of any state or local jurisdiction. By entering the Sweepstakes, you agree to these Official Rules, which are a contract, so read them carefully before entering. This contract includes limitations of your rights and remedies. 2. To Enter: Purchase a minimum of one ticket to any movie or Event Cinema presentation at the web site located at ShowcaseCinemas.com to be automatically entered into this sweepstakes. Alternatively, submit an email to ShowcaseEntry@National-Amusements.com or send a paper entry to ShowcaseCinemas.com Sweepstakes, 846 University Ave., Norwood, MA 02062. Include your full name, home address and date of birth in all alternatively submitted sweepstakes entries. Multiple entries are permitted, to a maximum of one entry per person per day during the Promotion Period. By entering into this Sweepstakes, you are consenting to be bound by these Rules. 3. Eligibility: The Sweepstakes is open only to legal residents of Connecticut, Massachusetts, New York, Ohio and Rhode Island who are 18 years or older (or age of majority in his/her state of residence) at the time of entry, subject to all applicable federal, state and local laws and regulations. The Sweepstakes is not open to (a) any employees of Sponsor, the prize providers, or any of their respective parent companies, subsidiaries, affiliates, or advertising or promotion agencies (collectively, “Promotion Entities”), or (b) any such employee’s immediate family members (e.g., spouse, parent, step-parent, sibling, step-sibling, half-sibling, child, and step-child) or any person living in the same household as such individuals. Any false or deceptive entries or acts (including, if applicable, creating or using multiple accounts with the same social media tool in order to enter multiple times) by you will render all entries by you ineligible. Any use of robotic, automatic, programmed, or similar methods of entry by you will render all entries by you ineligible. Partial and incomplete entries may be disqualified. Your entry (and any materials (including photos) that you submit with any entry) may not (i) violate, misappropriate, or infringe any intellectual property, publicity, contractual, privacy, or other right of any third party or any applicable regulation, guideline or community standard, (ii) contain material that is offensive, defamatory, threatening, abusive, vulgar, sexist, discriminatory or otherwise inappropriate, or (iii) promote or incite violent, dangerous or antisocial behavior. 4. Winner Selection and Notification: Upon submission, entries become the sole property of Sponsor, and none will be acknowledged or returned. Sponsor may disqualify any entry that is incomplete or that does not comply with these Official Rules. The winner will be selected in a random drawing from among all eligible entries received. The random drawing will be conducted on or about March 4, 2019. Odds of winning depend on the number of eligible entries received. The winner will be notified (the “Winner Notification”) by phone, email, social media or other means, depending upon method of entry, within five (5) days after the drawing, using contact information provided at the time of entry. If, for any reason, more than one bona fide winner comes forward seeking to claim a prize, Sponsor reserves the right to award only the number of prizes stated in these Official Rules via a random drawing from among all persons with bona fide claims for the prize, and inclusion in such selection process shall be your sole and exclusive remedy under such circumstances. The winner will be required to (a) respond to the Winner Notification (as directed in the Winner Notification) within three (3) days after its transmission and (b) complete, sign, have notarized, and postmark an Affidavit of Eligibility and Liability and Publicity Release (where not prohibited by law and if requested by Sponsor) within five (5) business days of its delivery to the winner. All prizes will be awarded provided that a sufficient number of eligible entries are received. 6. General Prize Terms: The ARV of the prize is based on information available to Sponsor. The Promotion Entities are not responsible for, and the winner will not receive the difference (if any) between, the actual value of the prize at the time of the award and the stated ARV in these Official Rules. Prizes are subject to availability and Sponsor reserves the right to substitute a prize of equal or greater value in Sponsor’s sole discretion (which prize shall be subject to these Official Rules). Prizes are nonrefundable, not redeemable for cash, and not transferable, and no cash alternative is available. If the winner is unable to, or elects not to, use any part of the prize, the winner will forfeit that part of the prize package. The prize is limited to that specified in Section 5 above, and all other expenses not specifically mentioned herein are not included in the prize and are solely the winner’s responsibility. Any and all taxes on a prize are the sole responsibility of the winner of such prize. The value of any prize awarded to a winner may be reported for tax purposes as required by law, and such winner must provide any additional information requested by Sponsor so that Sponsor can comply with applicable tax reporting obligations. By participating in the Sweepstakes, you waive the right to assert any and all claims arising from or related to costs of verification or redemption of or travel to claim a prize and any liability or publicity that might arise from claiming or seeking to claim a prize. Additional restrictions may apply. 7. Disclaimer: The Promotion Entities are not responsible or liable for lost, late, damaged, destroyed, delayed, stolen, misdirected, incomplete, or illegible entries; entries not received during the Promotion Period for any reason; or other errors of any kind. Prizes are awarded “as is, where is,” without warranty of any kind, express or implied, including without limitation any warranty of merchantability or suitability for a particular purpose. The Promotion Entities are not responsible or liable for any typographical or other printing errors in the offer or administration of the Sweepstakes, including, but not limited to, errors in the printing or posting of the offer or these Official Rules, the selection or announcement of winners, or the distribution of any prizes. In the event that viruses, bugs, tampering, fraud, technical failures, unauthorized human intervention, acts of God, acts or regulations of any governmental or supra-national authority, war, national emergency, accident, fire, riot, strikes, lock-outs, industrial disputes, acts of terrorism, or any other matter beyond Sponsor’s reasonable control (each, an “Uncontrollable Event”) prevents, corrupts, or impairs the administration, security, fairness, or proper play of the Sweepstakes such that it cannot be conducted as originally planned, Sponsor reserves the right to cancel, terminate, or suspend the Sweepstakes at any time in its sole discretion, and the Promotion Entities shall not be responsible or liable in any manner for such Uncontrollable Event or any such cancellation, termination or suspension. In the event an Uncontrollable Event occurs prior to the announced date for winner determination, Sponsor may determine the winner by conducting a random drawing from among all eligible entries received up to such time of cancellation, termination, or suspension. In the event an Uncontrollable Event interrupts, interferes with, or disrupts the provision of any prize, Provider may substitute a prize of equal or greater value in its sole discretion. 8. Disqualification: Sponsor may disqualify any winner (and cause any applicable prizes to be forfeited) due to any of the following: (a) the winner fails to comply with any of the terms, conditions, restrictions, or limitations of these Official Rules (as determined by Sponsor in Sponsor’s sole discretion); (b) the winner fails to respond to the Winner Notification or any other notice (in each case as set forth in such notice) within three (3) days after its transmission; (c) the winner fails to complete, sign, have notarized, and postmark an Affidavit of Eligibility and Liability and Publicity Release (where not prohibited by law and if requested by Sponsor) within five (5) business days of its delivery to the winner; or (d) the inability of Sponsor to contact a potential winner or the return of any Winner Notification, notice, or prize as undeliverable. In the event of disqualification of a winner or forfeiture of a prize, Sponsor may select an alternate winner in a random drawing in Sponsor’s sole discretion. 9. Release and Indemnification: BY PARTICIPATING IN THE SWEEPSTAKES, YOU AGREE: (A) TO BE BOUND BY THESE OFFICIAL RULES AND THE DECISIONS OF SPONSOR AND (B) TO FOREVER AND IRREVOCABLY RELEASE, DEFEND, INDEMNIFY, AND HOLD HARMLESS THE PROMOTION ENTITIES (AND THE DIRECTORS, OFFICERS, EMPLOYEES, AGENTS, SUCCESSORS, AND ASSIGNS OF EACH OF THE FOREGOING) FROM AND AGAINST ANY AND ALL LIABILITY FOR CLAIMS, JUDGMENTS, FINES, COSTS, EXPENSES, CAUSES OF ACTION, PERSONAL INJURIES, LOSS, OR DAMAGE, INCLUDING, WITHOUT LIMITATION, DEATH AND PROPERTY DAMAGE, RESULTING FROM, ARISING FROM, OR IN CONNECTION WITH (I) THE SWEEPSTAKES OR PARTICIPATION (OR THE INABILITY TO PARTICIPATE) IN THE SWEEPSTAKES AND/OR ANY ELEMENT OR ACTIVITY THEREOF; (II) ANY PRIZE, INCLUDING ANY LIABILITY OR DAMAGE RESULTING FROM, ARISING FROM, OR IN CONNECTION WITH (1) LOST, LATE, STOLEN, MISDIRECTED, DAMAGED, OR DESTROYED PRIZES; OR (2) THE ACCEPTANCE, POSSESSION, USE, OR MISUSE OF ANY PRIZE, ANY DEFECTS IN ANY PRIZE, OR ANY INABILITY TO USE ANY PRIZE; OR (III) ANY ERRORS IN THESE OFFICIAL RULES OR ANY MARKETING MATERIALS IN CONNECTION WITH THE SWEEPSTAKES. 10. Disputes; Governing Law: Except where prohibited, you agree that any and all disputes, claims and causes of action arising out of or connected with the Sweepstakes or any prize awarded shall be resolved individually, without resort to any form of class action. Any disputes that may arise hereunder will be governed in all respects by the laws of the without regard to the conflicts of laws principles of any jurisdiction. Venue with respect to any such disputes will be had only in the state and federal courts located within the Commonwealth of Massachusetts, without waiver of any right to removal by Sponsor pursuant to 18 U.S.C. §§ 1441, et seq. 11. Publicity and Intellectual Property: Where permitted by law, by participating in the Sweepstakes, you grant the Promotion Entities, and those acting pursuant to the authority of any of the foregoing, the right to print, publish, broadcast, and use any materials (in whole or in part, or in edited form) you submit in connection with the Sweepstakes, as well as city and state of residence, and other biographical information, for advertising and promotional purposes throughout the world in any and all media now known or existing at any time in the future, without further approval, notification, or compensation. 13. Guests: Where a prize permits guest of a winner to participate, such winner is responsible for his or her guest and shall ensure that such guest complies with Sponsor’s and each prize provider’s procedures and policies. 14. Conduct: By entering the Sweepstakes and accepting a prize, the winner agrees to behave in accordance with all applicable laws and generally-accepted social practices in connection with participation in any Sweepstakes- or prize-related activity. The winner understands and agrees that Sponsor and each prize provider has the right, in their respective sole discretion, to disqualify and remove the winner (and/or his or her guest, if applicable) from any activity at any time if the winner’s (and/or his or her guest’s) behavior at any point (a) is uncooperative or disruptive; (b) annoys, threatens, or harasses any other person; (c) may or does cause damage to any person or property or the reputation of Sponsor or such prize provider; or (d) otherwise violates the policies of such prize provider; and, in such a case, the winner will forfeit all remaining elements of the prize and still be solely responsible for all taxes and other expenses related to the prize. 15. List of Winners / Copy of Official Rules: To obtain a list of winners (available approximately two months after the date of winner determination) or a copy of these Official Rules, mail your request, including a self-addressed, stamped envelope, to National Amusements, Inc., Attn: ShowcaseCinemas.com Sweepstakes, 846 University Ave., Norwood, MA 02062. Requests must be received within two (2) months of the end of the Promotion Period. 16. Miscellaneous: Decisions of Sponsor are final and binding in all matters related to the Sweepstakes. The invalidity or unenforceability of any provision of these Official Rules will not affect the validity or enforceability of any other provision. In the event that any provision of these Official Rules is determined to be invalid or otherwise unenforceable or illegal, the other provisions will remain in effect and will be construed in accordance with their terms as if the invalid, unenforceable, or illegal provision was not contained herein. Sponsor’s failure to enforce any term of these Official Rules will not constitute a waiver of that provision. When terms such as “may” are used in these Official Rules, Sponsor has sole and absolute discretion. You agree to waive any rights to claim ambiguity of these Official Rules. Headings are solely for convenience of reference and will not be deemed to affect in any manner the meaning or intent of any provision. In the event there is a discrepancy or inconsistency between disclosures or other statements contained in any Sweepstakes-related materials and these Official Rules, these Official Rules shall prevail, govern, and control, and the discrepancy will be resolved in Sponsor’s sole and absolute discretion.